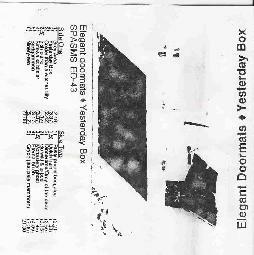 Elegant Doormats - "Yesterday Box"
Elegant Doormats were the trio of long time ST 37 bassist/vocalist Scott Telles, Leigh Newsom on guitar and original ST 37 drummer John Foxworth, plus guests on synths, guitar and electric cello. A lot of this reminds me of Elliott Sharp's mid-80's band Mofungo, with it's avant punky song style, quirky ever-shifting rhythms and always interesting guitar work. Though of course as this was released in 1986 it's entirely possible that Sharp heard Elegant Doormats and then formed Mofungo. Ya never know! In any event, the band produced some really good songs that were accessible, often humorous, and backed by thoughtfully arranged and well played music. "Ninety-Two" is one of my favorites and definitely a track with the synth, cello and extra guitar guests. The style is similar to the previous tracks but it's got a much better and fuller sound, with lots of cool freaky guitar bits and efx embellishments. In fact, the subsequent tracks all seem to have the better recorded sound. I could actually come up with a load of 1980's analogies that Elegant Doormats sound like, though the Doormat have most of them beat in terms of having played more imaginative instrumental arrangements. The closing track, Cryph (Last Pale Mammoth)" is a bit different from the rest, sounding like a 7 minute heavy psych, no-wave instrumental. It rocks hard and freaks out! Diehard ST 37 who want some history should check this out, as should anyone into the 1980's avant-rock underground. Crazy songs for silly souls.